The president signed a document setting out the priorities of his government, including compliance with US law on the Cuban nation, in particular the provisions that govern the blockade and the prohibition of the citizens of that country to visit Cuba. Trump “laid the foundations” for supposedly “empowering the Cuban people and developing greater economic and political freedom,” regarding the prohibition of companies from that nation to establish business with Cuban state companies. Although diplomatic relations – re-established on July 20, 2015 – will continue, the new actions of the Trump administration are a step backwards towards the normalization of bilateral ties, and come loaded with old anti-Cuban rhetoric. 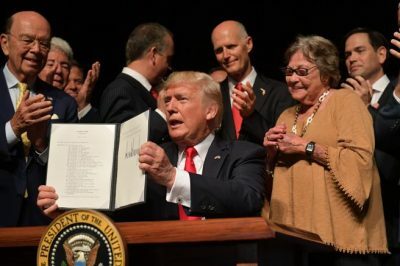 He reinstated the ban on individual travel by Americans to Cuba, and those who venture to do so will have to do so-as during George W Bush Administration-through non-governmental organizations and in groups. Meanwhile, it leaves intact what Barack Obama has established that Cubans living in that country can visit their family on the island without restrictions and send remittances. The blockade is reaffirmed, said the president in his speech in Miami, while he ignored the calls at the United Nations and other international forums for the termination of extraterritorial politics, which in 2016 had at the UN with the support of all the member countries of that body and where for the first time the United States and Israel themselves abstained. In the policy memorandum signed by the President, the Treasury and Commerce departments are instructed to begin the process of issuing new regulations within the next 30 days. The White House clarified that the policy changes will not take effect until the corresponding Departments publish the new regulations, a process that can take time. While the Americans are still banned from touring on the largest island in the Caribbean, the expansion of the categories that the Obama administration led to an impressive increase in the number of trips to Cuba. Some 284,997 Americans visited the island in 2016, for a 74 percent growth over the previous year, according to official figures. The trend for growth has been maintained during 2017, and by this date of the year the figure is around the same amount as in the previous calendar. The decline in ties comes despite the overwhelming support of the Americans for their right to visit Cuba, and the recent filing of a bill sponsored by 55 senators that defends the freedom to travel to the neighboring nation. The adoption of this position by the US government reaffirms the economic, commercial and financial blockade against Cuba, which the administration of Barack Obama declared at the time as a failed and inoperative policy, after more than half a century since its establishment.